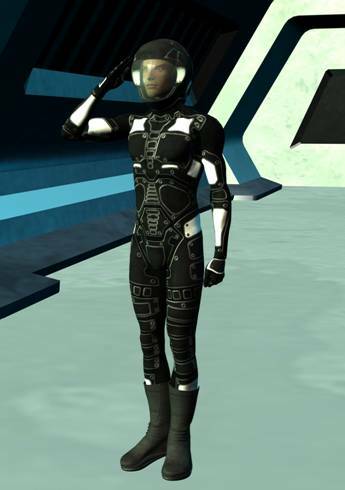 This is the standard body armor of the Terran Protectorate pilot, particularly fighter pilots and mecha pilots who operate machinery with little extra space. The armor is fully environmental and specifically geared to handle decompression and vacuum. It has a special “quick seal” feature that instantly causes the gloves and helmet to seal when exposed to vacuum. The pilot only needs to wear them loosely and not concern himself with them being fitted exactly, allowing more comfort. The armor is extremely light and does not interfere with motion; something Protectorate pilots demanded. While it lacks in actual weapons protection, its primary purpose is to protect against environmental extremes, a job it excels at. The “soft suit” has also taken off in the private sector among explorers, independent spacers and so-called “bush” pilots. M.D.C. by location: Main body: 45, Helmet: 20, Arms: 10, Legs: 15. Weight: 10 lbs for the actual suit and back tank. The helmet weighs 4 lbs. No movement penalties. Features: 24-hour air supply, maneuvering thrusters for EVA capabilities, built-in helmet radio, double the standard body armor protection from heat and cold. Armor takes half damage from mega-damage fire and cold, including plasma. Colors: Black with squadron color highlights. Market Price: 15,000 credits. Fair availability. Functionally identical to the soft suit in most ways, although with a radically different exterior design, this pilot armor adds rigid plates and extra padded protection over all vital areas. Typically used by gunners, pilots expecting action out of their vehicles, and pilots of shuttles, dropships, and other craft with spacious cockpits and increased out-of-cockpit engagement of the enemy. Also preferred by flight officers attached to the colonial marines. It has a unique internally distributed emergency life support system that does not require a visible backpack. It also has a built-in emergency beacon as well as an internal heads-up display compatible with most human-made spacecraft. It is becoming more and more popular among independent fighter pilots and is seeing increased use in the front lines by even Crossbow pilots. M.D.C. by location: Main body: 70, Helmet: 20, Arms: 20, Legs: 30. Weight: 20 lbs for the suit. The helmet weighs 4 lbs. -5% to prowl and all physical skills. Features: Same as the soft suit, plus emergency beacon and universal faceplate H.U.D. Market Price: 30,000 credits. Poor availability. Popular among pirates and bandit spacers. 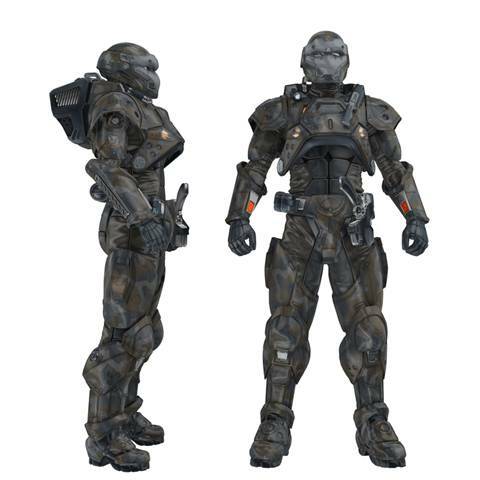 This standard marine armor is a mixture of ballistic and energy deflecting layered cloth and a mega-damage armored vest. It is not environmentally sealed in its standard formation, but it is designed to work with the standard Protectorate helmet (same as armors above), and has the quick-seal system for emergencies. Generally worn by M.P.s, Special Forces and commandos for whom stealth is paramount, as well as by marine support personnel. It is also, in general, the default armor of marines not expecting immediate and direct combat. M.D.C. by location: Main body: 60, helmet (optional): 20, arms: 15, legs: 30. Features: Thermal and cold protection, tactical datalink headset. Comes in black, white, and all standard camouflage patterns. Market Price: 30,000. Poor availability. This is the heavy combat armor utilized by colonial marines on the frontlines. 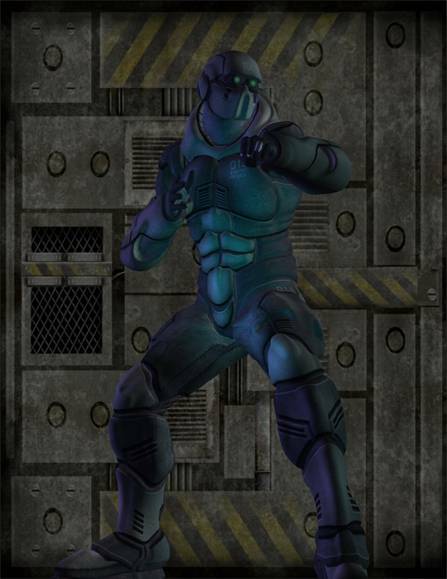 It is the toughest armor the Protectorate makes, fully environmental, loaded with features and is more of a combat armor system than just protective gear. A descendant of the U.S. military’s 20th Century Land Warrior I and II projects; the armor combines multiple elements to create a complete tactical system. Fully environmental, it uses a tactical datalink headset to link an entire squad into one fighting unit. Everything from ammunition stores, damage, bio-readings and even live video feed is accessible by everyone in a squad or platoon. Officers have access to even more information, and have a dedicated net connecting them with all other field commanders in a Company. Weight: 50 lbs., -10% to prowl and all physical skills. Features: thermal and cold resistance, able to withstand temperatures between -100 and 300 degrees Celsius. Occupants take no damage from impacts of under 150 M.P.H. or from falls of under 50 feet. +3 to roll with punch, fall or impact. Passive nightsight and infrared are standard. Comes in black, white, and all standard camouflage patterns. Market Price: 50,000 credits. Rare, restricted ownership and most market models are sold without tactical datalink headset. From Science Frontiers, a joint Davinchian/Hedonis company that is behind the design of the Crossbow and Jack Jumper, this suit is very popular among Davinchians and spacers. It is a fully-functional space suit, as well as body armor, with a 4-hour air supply, maneuvering jets (25 mph) and a built-in personal computer, usually linked to the mainframe of the operator’s spaceship. This computer gives the operator basic remote control of a slaved ship up to a range of 5 miles, even allowing limited piloting (-20% to all piloting rolls…if doing anything more than minor adjustments in zero gravity). 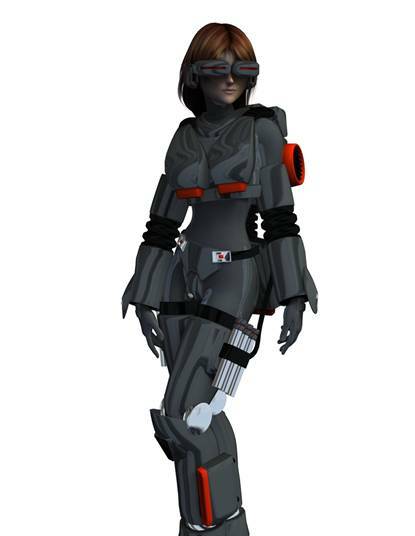 M.D.C. by Location: Main Body: 60, Helmet: 25, Arms: 25, Legs: 35, EVA pack: 20. Market Price: 35,000. Commonly available. Often sold as a package deal to buyers of new personal transports. Usually referred to as AVS by most humans, the Fahreen provide this armor to their thralls and sell it to pirates, raiders and mercenaries as well. 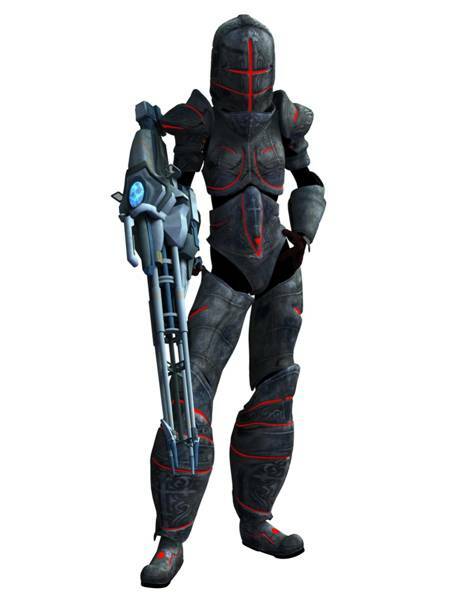 It is a tough, durable armor suitable for use by humans, Xintrin, Mogg’Theran and most other humanoid species ranging between four feet and eight feet in height. It is fully EVA capable with maneuvering jets, boots with electromagnetic grips and extensive life support systems. M.D.C. by Location: Main Body: 90, Arms: 35, Legs 50, Helmet: 30. Weight: 40 lbs. -15% to prowl and all physical skills. Features: Nightvision, Electro-magnetic adhesive hand and foot pads (800 Newton resistance), EVA thrusters (50 M.P.H. relative speed, 2 minutes total engine burn), 18-hour air supply, plus all standard environmental body armor features. Market Price: 55,000 credits. Fair availability. This form-fitting armor is probably one of the most common body armors throughout human-controlled space. 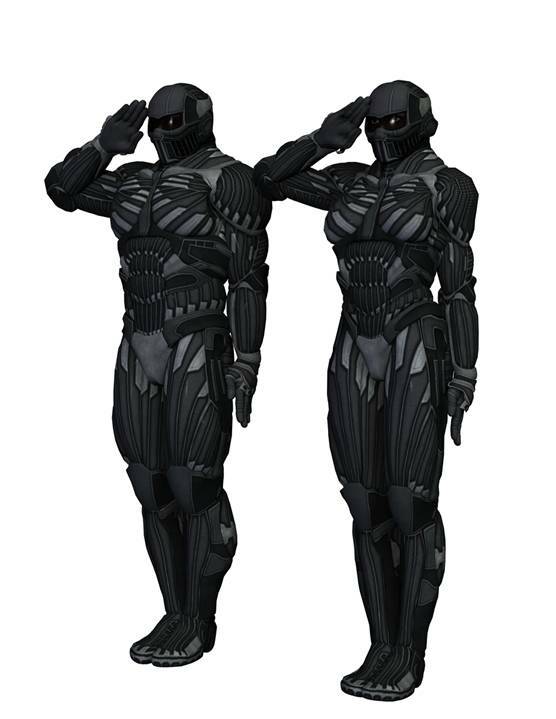 Specially fitted for each wearer, the suit is a combination of nano-tube carbon fibers, energy resistant crystalline weave and advanced composite ballistics cloth. In addition, it uses “reaction cloth” which stiffens the instant high-speed impact or shearing force contacts the fabric. This means that if the wearer is shot with a bullet, the fabric hardens for about 1/10th of a second at the point of impact, saving the wearer from damage, as long as the fibers can repel the kinetic force of the bullet. The suits are expensive and, while giving excellent protection for their mass, have almost no other features. They come with a universal sealing collar that can link with most helmets to give environmental protection. The wearer, however, must find an alternate means of oxygen (usually a life support backpack). Unlike most combat armor, however, the Unimesh suit does protect against falls and crashes (wearer only takes ¼ damage from fall or crash damage). Weight: 9 lbs. No penalty to prowl or physical skills. Features: Universal sealing collar for helmets, crash protection. Market Price: 40,000 credits. Excellent availability. GM here stands for General Model. 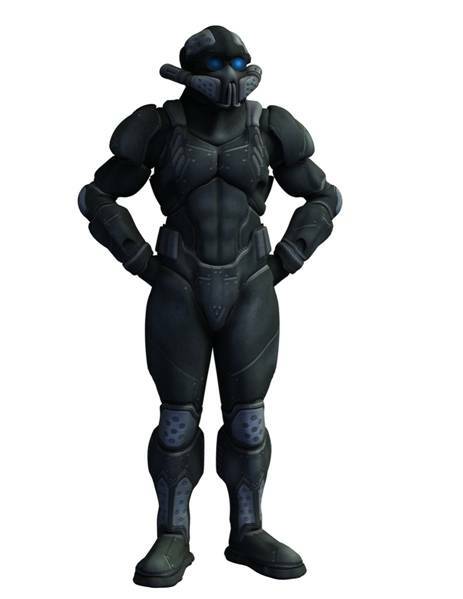 The pictured model is the color scheme specifically used by the Guardsmen, but the suits themselves are for sale to the general public in a variety of colors. They are ideal for fighter pilots, gunners, and anyone pulling space flight duty in confined spaces. 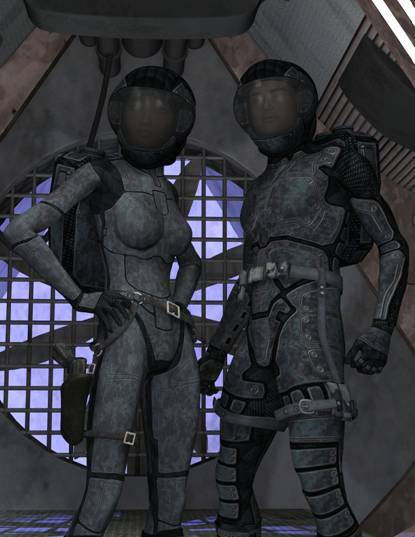 Skin tight, and using similar technology as the Unimesh suit above, these are the standard “soft” flightsuits in use throughout human space. They are fully environmental, have a fiber optic sub-dermal network for easy linkage to peripherals like air tanks and flight systems, and are very affordable. There are numerous manufacturers, but all the stats and basic functions are the same. Weight: 7 lbs, helmet weighs another 5 lbs. No penalties to physical skills or prowl. Features: Fully EBA, small backpack life support tank provides 6 hours of air. Helmet has universal HUD interface that can link with almost all human-made space vehicles, projecting the vehicle’s HUD on the inside of the helmet. Market Price: 20,000 credits. Wide availability. 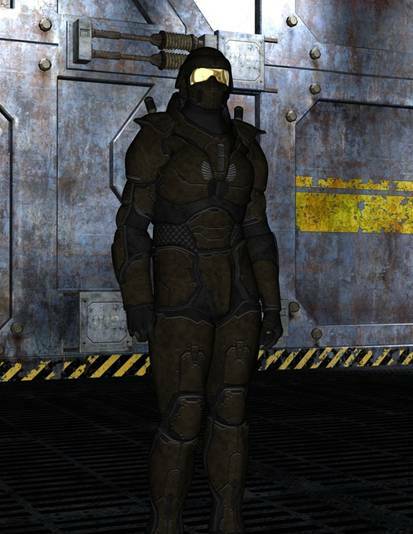 This is the standard armor of the Guardsmen and incorporates a Unimesh suit with additional heavy padding, boots and helmet for added protection. The package adds all the bells and whistles missing from the standard unimesh, greatly increases protection, and does not sacrifice much of the armor’s vaunted flexibility. The standard configuration is not environmentally sealed, but the collar can fit most space suit helmets. 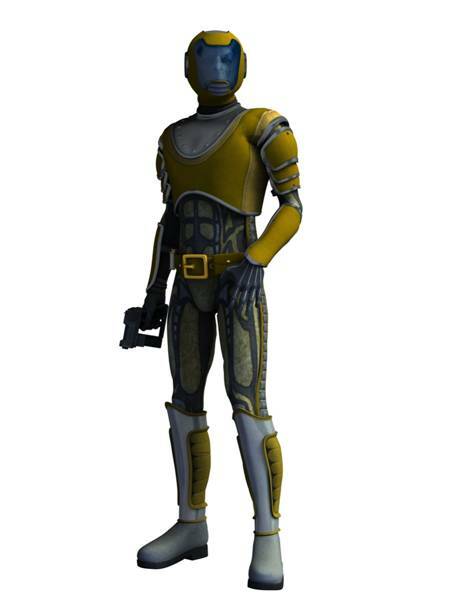 The extra pieces are not sold to the public, and wearing the chestpiece and helmet can result in charges of impersonating a law enforcement official in the Free Colonies. 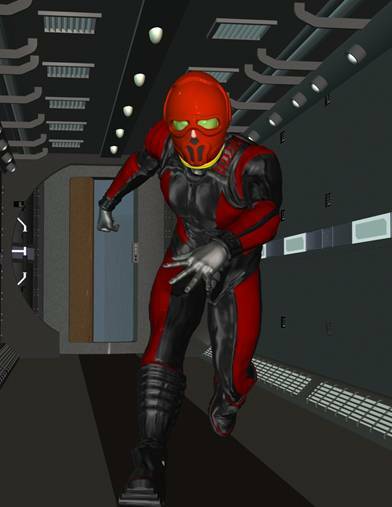 M.D.C.: The Body armor addition adds 40 M.D.C. to the main body of the unimesh suit, for a total of 95 M.D.C. The helmet has 30 M.D.C. Weight: A total of 18 lbs. -5% to prowl and -10% to other physical skills. Features: Helmet radio, visor HUD and internal mini-computer, targeting sight adds +1 to strike with ranged weapons, video and audio recorders for evidence gathering, infra-red imaging system in visor, as well as macrobinoculars and 10x digital magnification. Market Price: Not for sale. 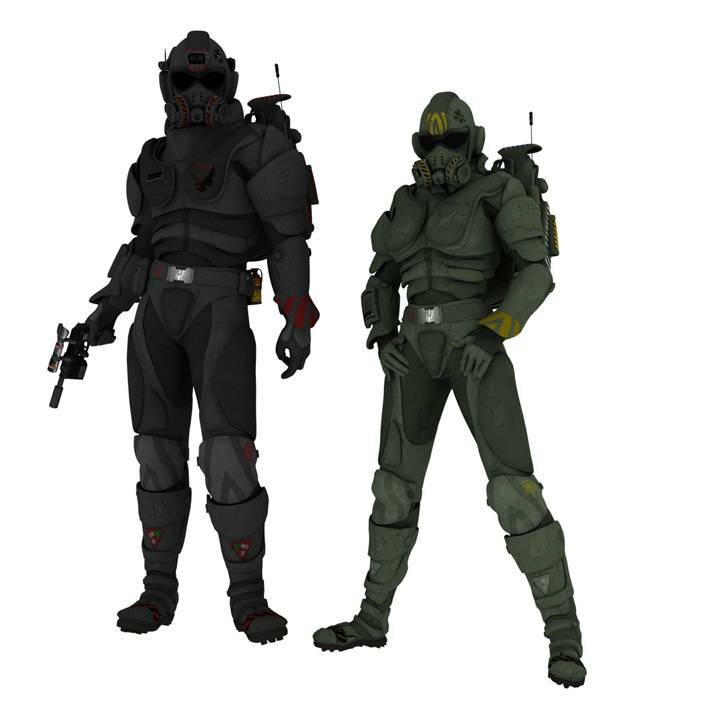 The Kessler line of body armor, created by Kessler Industries on New Tortuga, is aimed at the mercenary and paramilitary market. It is all designed to look intimidating, provide maximum armor protection, and ease of use. 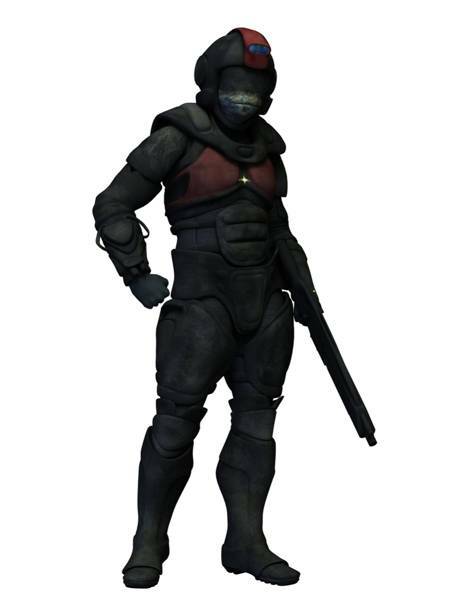 The Kessler Heavy Combat suit is the most popular of the series, and is considered one of the best EBA’s on the market. Though short on bells and whistles (just all the standard EBA fixins), it is good on protection and is often used as a space suit. It has an internal “peripherals board” that allows the armor to link up with just about any armor addition for any mainstream market armor. 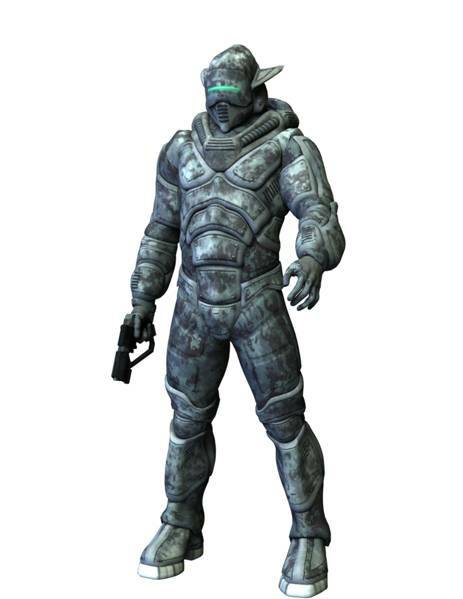 Several Free Colony militias use this armor as standard soldier EBA. M.D.C. by Location: Main Body: 110, Arms: 35, Legs: 50, Helmet: 30. Features: All standard environmental body armor features, plus an adaptable “peripherals board” that allows the user to attach any “extra” made for any other armor, such as Guardsmen padding or the EVA system off of the A-Class Hardsuit. Market Price: 50,000 credits, good availability. This is a lighter, more maneuverable environmental body armor, popular among scouts, Special Forces units, assassins and bounty hunters. It sacrifices some protection for full mobility and a stealth system that provides both visual and thermographic stealth options. 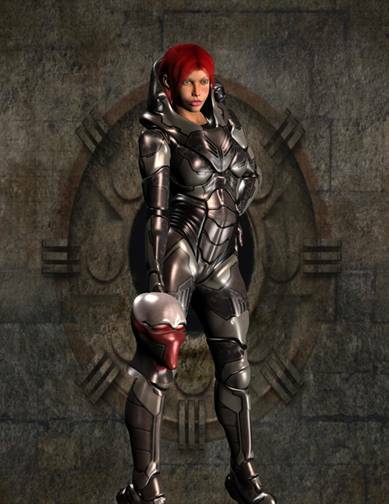 It is often the preferred armor of female mercenaries. Weight: 20 lbs., provides a +20% bonus to prowl rolls, no penalties to other physical skills. Features: All standard environmental body armor features, plus a visual and thermographic stealth system that makes the wearer mostly translucent. The helmet must be worn for the system to work. Invisible to thermographic imaging. Market Price: 60,000 credits. Poor availability. This heavy armor straddles the line between environmental armor and full power armor. Only due to the fact that it is not sold with any weapons is it kept off the restricted military purchase list. Still, the price keeps it out of range of many buyers. Mercenary companies, pirates, and even Protectorate Special Forces love it, as it provides excellent protection, enhanced abilities, and often scares the bejesus out of people. M.D.C. by Location: Main Body: 160, Arms: 70, Legs: 100, Helmet: 50. Weight: 60 lbs. : -20% to other physical skills, but only a -10% to prowl due to its specific design. Swimming is impossible. Features: Long-range transceiver (200 miles), onboard combat computer (+2 to strike with all ranged weapons), mini-radar (5 miles), breach auto-seal system (armor is fully environmental until MDC of Main Body or a limb is completely depleted), crash protection (10% damage from falls or crashes), micro-thrusters for EVA (20 M.P.H. ), strength of user is increased by 10 (use augmented strength chart), and speed is doubled. 24-hour rechargeable internal battery. Market Price: 70,000 credits; rare. By most people’s measure, this is a glorified, earth-bound power armor. Even though it has no weapons, its mass and design still earned it a restricted status. One must have a Class-2 Weapons permit to own it. That hasn’t stopped most users, however. After all, if you come across someone using it blatantly, getting them to take it off is a dangerous proposition. It has all the features of the Atlas, provides better armor, more strength, and enhanced sensory equipment. It is also the most expensive armor currently sold on the market. M.D.C. by Location: Main Body: 200, Arms: 80, Legs: 120, Helmet: 80. Weight: 70 lbs. : -20% to prowl and all physical skills. Swimming is not possible. Features: All the features of the Atlas, plus strength is increased to +15, and the armor comes equipped with thermographic imaging, 30x digital magnification, palm-mounted cyberlink to all hand-held ranged weapons (increase bonus to strike to +3), extended 8-hour air supply, dual battery system for 48 hours of constant use, and jump jets allowing the user to leap 20 feet high or 40 feet horizontally in standard earth gravity. Market Price: 100,000 credits. Very rare and restricted. As the name implies, this armor is worn by Mogg’Theran expecting heavy combat; including space marines, defenders preparing to repel boarders and special forces units. It provides excellent armor protection with minimal hindrance to mobility. M.D.C. by Location: Main Body: 110, Arms: 40, Legs: 50, Helmet: 35. Weight: 15 lbs. -5% to prowl and other physical skills when worn by a Mogg’Theran, -10% for all others. Features: The standard design includes a built-in radio and video transmitter, tactical data uplink, thermographic and nightvision sensors, plus all other standard environmental body armor features. Market Price: 45,000 credits. Fair availability. The standard combat armor of the Mogg’Theran, the basic design has been in use for the last 320 Earth years, albeit regularly upgraded. It is lightweight, durable, and allows maximum flexibility. Since it was so mass-produced t is also very affordable and parts are common. However, it only fits the Mogg’Theran and has only basic features. M.D.C. by Location: Main Body: 70, Arms: 25, Legs: 35, Helmet: 20. Weight: 10 lbs. No penalties to prowl or other physical skills. Features: Standard body armor features, plus a heads-up display interface with all Mogg’Theran starships and vehicles. Market Price: 30,000 credits. Excellent availability. 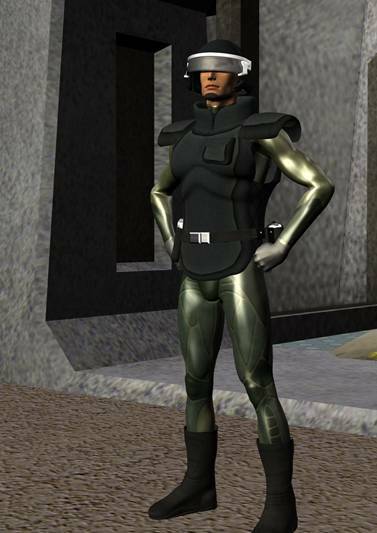 The standard body armor used by the Merchant Guild Defense Forces, this armor is also sold throughout the Free Colonies and Empire of Many Suns. It is typically worn as a non-environmental suit, but has an attachable gas mask that can seal the faceplate, making it environmentally sealed in two actions. The suit includes a built-in wrist computer and uplink ports, ideally for ease of use by merchants who want to make a sale in less-than-savory surroundings without having their credits stolen. M.D.C. by Location: Main Body: 75, Arms: 25, Legs: 35, Helmet: 30. Weight: 20 lbs. -10% to prowl and all physical skills. Features: Standard, plus wrist computer and headlamp. Market Price: 30,000 credits: Good availability. 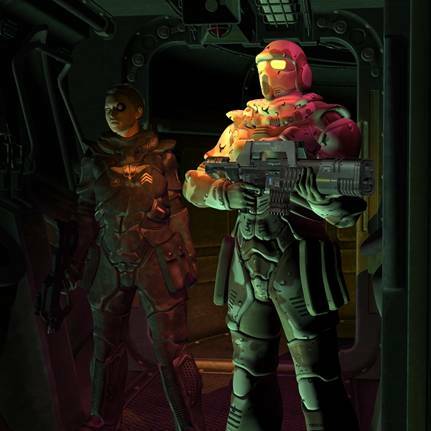 The Paladin series of armor and exoskeletons are an extremely popular human armor line used almost exclusively by mercenaries. The Cavalier is the line’s showcase armor. In addition to superior armor protection, the Cavalier has an antigravity flight system with high maneuverability and speed. It is also the only Paladin series armor to have built-in weapons. If it provided any more armor protection, it would be considered a power armor. It is considered military hardware and is illegal to own or operate on most planets, usually used only in combat theaters by mercenaries or well-equipped planetary defense forces. M.D.C. by Location: Main Body: 225, Arms: 50, Legs: 100, Helmet: 50, Flight Pack: 100. Weight: 110 lbs. -10% to prowl and all physical skills. Features: Can Hover or Fly at speeds of up to 350 m.p.h. with a maximum ceiling of 30,000 feet in an Earth-like atmosphere. Tactical Data uplink, HUD, Nightvision, thermographic vision, universal headjack port, infrared chest spotlight, maneuvering jets, 24-hour air supply, targeting sight (+2 to strike with all ranged weapons), +10 P.S. to the wearer’s strength, which becomes Robotic, Radar (50 mile range, able to track 50 different targets at once), combat computer with target warning system (alerts the wearer when he’s been “painted” by a radar, LADAR or laser targeting system). Helium-3 microfusion battery provides 72 continuous hours of use before refueling is required. Flight Pack Mounted Lasers (2): 3D6 M.D. per laser, 6D6 M.D. when fired as a pair (counts as one attack). Range: 2,500 feet. Note: Comes standard with a pair of Carnivore rocket pistols. But also frequently sold with a Crusader Gauss Cannon. Market Price: 450,000 credits when sold with the pistols, 500,000 credits when sold with the Crusader. Poor availability, as it is usually sold in bulk sales to mercenary units and militias. Designed for human use only, although it could be worn by Mogg’Theran and wingless Nix as well. 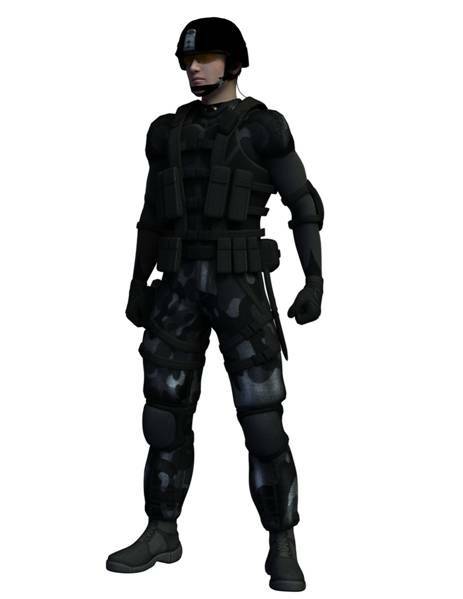 This is the Paladin series heavy body armor, frequently used by mercenary heavy infantry or special forces units. It provides excellent armor protection, and a number of high-end features. It is considered one of the best body armors on the market for its price. Weight: 30 lbs. -10% to prowl and all physical skills. Features: All standard environmental body armor features, plus a tactical data uplink, nightvision, HUD and universal headjack port. Market Price: 50,000 credits. Good availability. The only Paladin armor that is legal to own. Designed for human use only, although it could be worn by Mogg’Theran and wingless Nix as well. 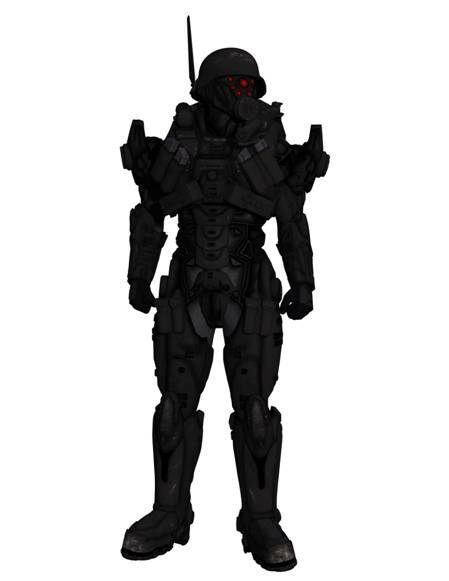 This is a ground-based heavy combat exoskeleton designed to dish out and take punishment. It provides the most protection of any of the Paladin series and is sold standard with a Crusader Gauss Cannon. Although it is technically an exoskeleton, most people consider it a match for most power armor. It is considered military hardware and is illegal to own or operate on most planets, usually used only in combat theaters by mercenaries or well-equipped planetary defense forces. M.D.C. by Location: Main Body: 260, Arms: 50, Legs: 100, Helmet: 70. Weight: 90 lbs., -15% to prowl and all physical skills. Features: Tactical Data uplink, HUD, Nightvision, thermographic vision, universal headjack port, 24-hour air supply, targeting sight (+2 to strike with all ranged weapons), +15 P.S. to the wearer’s strength, which becomes Robotic, Radar (50 mile range, able to track 50 different targets at once), combat computer with target warning system (alerts the wearer when he’s been “painted” by a radar, LADAR or laser targeting system). Helium-3 microfusion battery provides 96 continuous hours of use before refueling is required. Weapons: Comes standard with a Crusader Gauss Cannon, a Carnivore rocket pistol, vibro-knife and a belt of four plasma grenades. Market Price: 350,000 credits. Poor Availability. The archaic look of this armor is an illusion and stylistic romanticism, Underneath all the detailing is state-of-the-art environmental body armor that is heavy on bells and whistles. It comes in a variety of styles, almost all of them looking like some form of platemail. The more ornate the armor, the more its owner paid for it, but they all have the same general stats and abilities. There are versions that fit the Sigmari, Arkhon, and human body types, although it is rarely found worn by anyone other than Rhtharians. M.D.C. by Location: Main Body: 90, Arms: 30, Legs, 40, Helmet: 35. Weight: 20 lbs. -10% to prowl and all other physical skills. Features: Built-in radio and concealed digital camera, mini-radar (5 mile range), target warning system (alerts the wearer when he’s been “painted” by a radar, LADAR or laser targeting system), helmet-mounted mini-laser (hidden in the top of the glowing slit): 2D6 M.D., 10 shots per E-clip, 500-foot range, plus all other standard environmental body armor features. Market Price: 60,000 credits. Fair availability. Rare outside of the Empire of Many Suns. 1. Ceresteel plating: Bartered or stolen from the Arkhon, a number of strategically placed ceresteel plates give this armor limited energy resistance (half damage), but the plates are still vulnerable to physical attacks (double damage). After the first 25 points of damage, the ceresteel's M.D.C. is depleted, and the armor loses these properties. 2. Stealth field: This option allows the armor to blend in with its environment, making it nearly invisible. Adds +20% to all prowl rolls when the wearer is stationary or moving slowly (half speed). Drops to +10% if the character is moving at full speed. 3. Advanced computer interface: A built-in computer loaded with programs to assist in hacking and code breaking. Typically, interface is through a cybernetic eye or the helmet's H.U.D. However, it can also project a holographic interface terminal from the wrist. Provides an additional +10% to cryptography, computer operation, computer hacking and computer programming. 4. Assassin's Kit: Not sold openly, this option includes vibro-claws (2D4M.D.) built into the gloves, six vibro-knives and two hold-out pistol holsters concealed throughout the robes (-15% to detect concealment for anyone looking for weapons). It also comes with physical and electronic lockpicking tools built into the wrists (+10% to pick locks), as well as a carbon-fiber nanotube monofilament garrote (1D4 direct to hit points per attack when used to choke an unarmored opponent). M.D.C. by Location: Main Body: 85, Arms 25, Legs: 40, Helmet: 30. Weight: 20 lbs. -10% to prowl and all other physical skills. Each option adds 10 lbs. Features: All standard body armor features, plus up to two of the four packages above (each sold separately). Market Price: 50,000 credits base price, plus each additional option raises the price 15,000 credits (maximum of two). Each option increases the prowl and physical skills penalty by 5%. Fair availability with no options throughout the Empire of Many Suns. Poor availability if looking for suits with options anywhere but Arnuban-controlled colonies. Rare with or without options outside of the former Empire. A favorite among mercenaries. 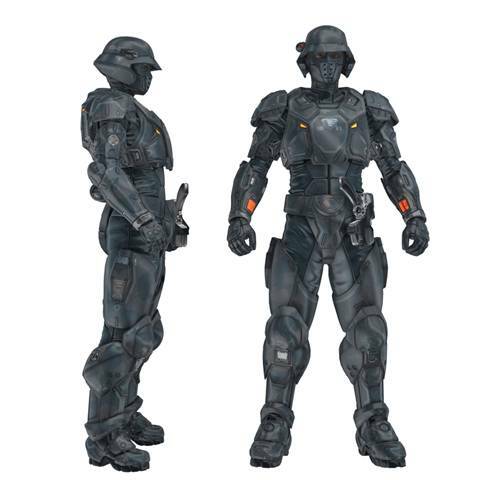 This is heavy combat suit designed especially for special forces units from several Yoarashi-controlled worlds. The Steel Samurai regiments, excelling at frontline heavy infantry duties, were allowed to wear these instead of standard issue Colonial Marine armor. It has become very popular among mercenaries, bounty hunters, and well-equipped corporate militias. In addition to excellent protection, the armor provides a number of valuable features, including multi-optic vision, a powerful communications package, and extremely efficient gear distribution, allowing the typical soldier to carry about twice as much ammunition and weaponry as usual due to the ergonomic design. M.D.C. by Location: Main Body: 100, Arms: 30, Legs: 50, Helmet: 40. Weight: 45 lbs. -5% to prowl and other physical skills. Features: Infra-red, Thermographic and Nightvision with 2,000 foot range. Laser targeting sight: +1 to strike with any ranged weapon. Built-in encrypted transceiver: range 150 miles (planetwide if there is a friendly satcom network in place and accessible). Also comes standard with a halogen, shoulder mounted spotlight, built-in medical kit (provides the skill First Aid at 50%, but only applicable to injuries suffered by the wearer of the armor, and stops all bleeding in 1D4 melee rounds). Also comes standard with a vibro-knife in a shoulder sheath. 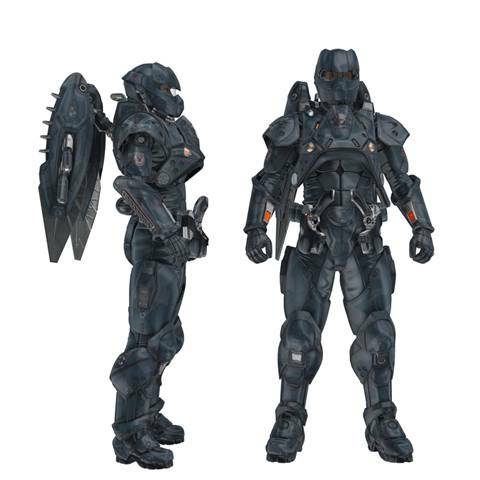 Market Price: 90,000 credits base price, making it one of the most expensive heavy armors on the market. Availability: Fair in the Terran Protectorate and Free Colonies, Poor in the Xintrin Merchant Guild, rarely available elsewhere. Made popular by agents of PHERI, particularly its FACE agents, the Echelon light exoskeleton offers excellent protection and durability and lots of bells and whistles. It is ideal for both exploration and combat in all sorts of hostile environments and is very popular among independent FACE agents, bounty hunters and scouts. It comes in two versions: The Echelon basic exoskeleton and the Echelon Deluxe. The deluxe version has a built-in MOH and other scanners that make it the preference of most of those using it for exploration work. Weight: 70 lbs., -10% to prowl and swimming. Features: Basic Unit: Fully environmental with twice the heat and radiation tolerances of standard armor, light electromagnetic pads (+15% to climbing rolls, +2 to disarm attacks) in hands and feet, 2-hour independent air supply, plus filtration system for indefinite air supply on planets with dangerous toxins and gases but otherwise breathable air, strength enhancers add +10 to to the wearer's P.S., which is rated as augmented, armored backpack with field radio with a range of 150 miles, unlimited if there is a satcom system in orbit. These are in addition to all standard body armor features. Deluxe Unit: All of the features above, plus an integrated multi-optic helmet system (same as standard), built-in portable surveyor (see gear section), targeting system adds +1 to strike, and a helmet light spotlight that can switch from regular halogen to infrared. Market Price: 100,000 for the Standard, 120,000 for the deluxe version. Fair availability for both. Knock-offs are sold by the Fahreen and the Xintrin. Can fit human, Xintrin and Mogg'Theran wearers. Despite the name, the armor has nothing to do with the magi classes. 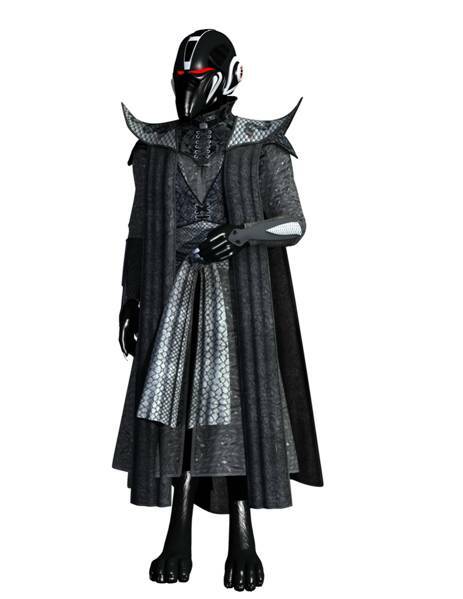 It is a medium body armor enhanced with an Armor of Ithan spell to give it protection equivalent to a heavy suit, without the penalties to movement or casting. The armor is made of magically treated natural fibers and padding and is very affordable. It can only be used by Nix however. With the exception of the Armor of Ithan forcefield, it has virtually no other features. The forcefield is the only protection the wings have. All damage is taken from the forcefield first, which recovers 1 M.D.C. per minute. 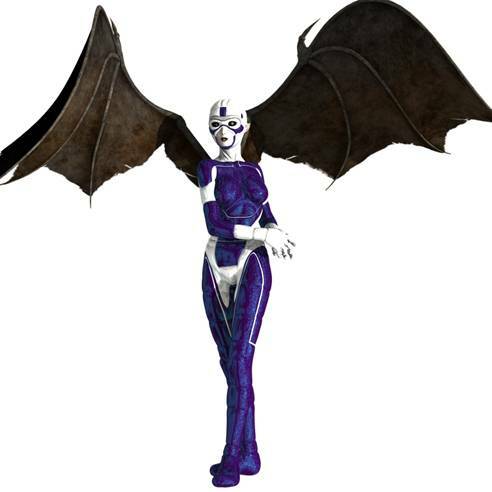 If the forcefield is down the armor is no longer fully environmental due to the wings, unless the Nix has cybernetic wings, in which case the armor continues to be fully environmental until it is reduced to about 20% of its maximum M.D.C.
Main Body: 60 M.D.C. Armor Ithan Forcefield: 20 M.D.C. Features: Does not interfere with spellcasting. Market Price: 40,000. Usable only by the Nix. Fair availability in Xintrin and Nix territory, extremely rare anywhere else.